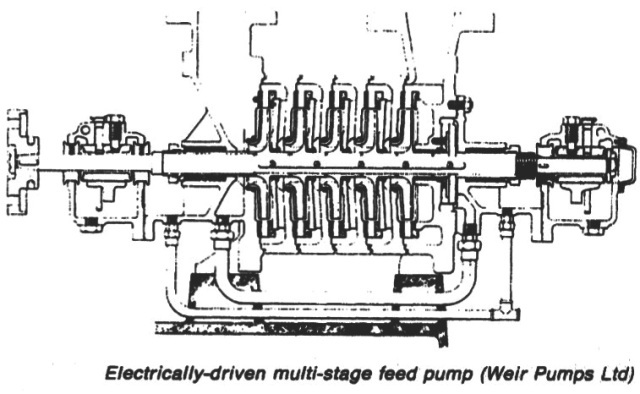 The Weir electro-feeder (Figure below) is a multi-stage centrifugal pump mounted on a common baseplate with its electric motor. The number of stages may vary from two to fourteen depending upon the capacity of the pump and the required discharge pressure. The pump body consists of a number of ring sections fitted with difrusers and held in position between a suction and discharge casing by a ring of steel tie bolts. The unit is supported on pads on the baseplate by two feet on each of the end casings, these feet being drilled to accommodate the holding down bolts. Tapered dowels are used to maintain the correct alignment, and the driving torque from the electric motor is transmitted through a flexible coupling. The shaft assembly is supported on two ring lubricated white metal lined journal bearings bedded into plurnmer blocks, the lower sections of which form oil sumps. An internal hydraulic balancing arrangement similar to that found in the turbo-feed pump automatically maintains the shaft assembly in its correct axial position at all loads during running. To avoid excessive wear on this balancing arrangement when starting the pump, it is essential that the discharge pressure be built up quickly, and for this purpose, and to eliminate the possibility of reverse flow, the pump is fitted with a spring loaded non-return discharge valve. Condensate cooled stuffing boxes packed with high quality packing, are used for shaft sealing and these can be additionally cooled by water-circulated cooling jackets in the suction casing and the balance chamber cover. A pressure-operated cut-out switch may be fitted which will automatically isolate the driving motor from its supply if the first stage discharge pressure falls to a predetermined value due to loss of suction pressure, cavitation or other reason.